What happened to Syrian official? 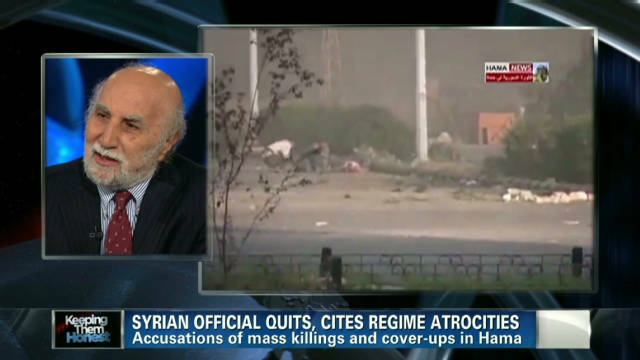 (CNN) -- What happened to the attorney general of Hama? The mystery surrounding judge Adnan Bakkour deepened Thursday as Syrian state media and the attorney general himself offered conflicting narratives of his whereabouts. Syria's state news agency first highlighted Bakkour's case Tuesday, when it reported that he had been kidnapped by "seven gunmen with rifles and machine guns" near the village of Karnaz. The next day, however, a video emerged on YouTube where a gray-haired man in a gray suit and tie introduced himself to the camera as Bakkour. "I announce my resignation from my position with the Assad regime and his gangs," the judge said. Bakkour calmly read from a piece of paper, while seated at a desk, with a glass of water by his left hand and a Toshiba laptop by his right. He went on to list reasons for his resignation. Bakkour accused Syrian authorities of killing 72 prisoners at the central prison in Hama. He claimed there was a mass grave with 420 bodies in a place called Al Khalidiya, and accused the government of trying to frame the opposition for the killings. "They (the government) asked me to prepare a report and present it to them showing that the victims were killed by the protesters," Bakkour said. The attorney general also accused security services of torturing and killing more than 300 demonstrators. CNN cannot independently confirm these claims. The government in Damascus has denied repeated requests for CNN journalists to visit Syria. Soon after the release of Bakkour's video resignation, the Syrian state news agency SANA fired back, saying the attorney general had been coerced by kidnappers to make false statements. Citing an unnamed "official source" in the city of Hama, SANA wrote that "armed terrorist groups who kidnapped" Bakkour "forced him to say these lies at gunpoint." The SANA article accused the Arabic news channel Al Jazeera of collaborating with kidnappers to mislead Syrian public opinion. But hours later, Bakkour was back on camera in another video uploaded to YouTube. This time, he appeared standing, wearing the same suit, but now without a tie. 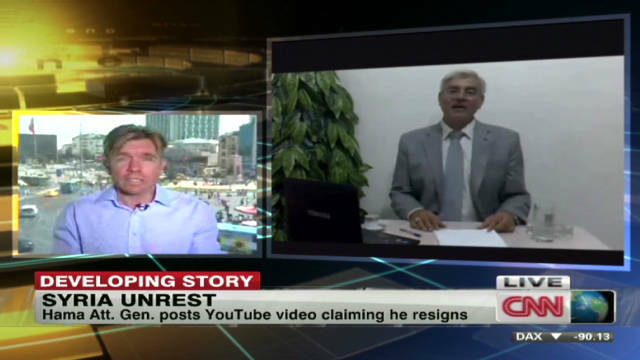 "What Syrian TV broadcast that I had been kidnapped by armed groups is untrue," Bakkour said. "I am now protected by the rebels and I am in good health. Today is Wednesday August 31st. Shabiha (pro-government militia) tried to kidnap me today but they failed to do so. I will make live statements as soon as I leave Syria, soon." If Bakkour has in fact defected, it would mark a major blow to the Syrian government, said one prominent Syrian activist in exile,. "He (Bakkour) has been appointed directly by the minister of justice. He is the highest authority among all the judges in Hama," said Rami Abdulrahman, director of the London-based Syrian Observatory of Human Rights. "We cannot confirm whether or not he has defected or whether he has been kidnapped," Abdulrahman added. The western Syrian city of Hama has been at the center of the protests, with fierce crackdowns last month that included military tanks and government forces raiding homes. Since the uprising first erupted in Syria more than five months ago, a number of men have appeared in similar videos wearing military uniforms and announcing their defection from the Syrian army. Meanwhile, Syrian state TV has also broadcast televised confessions of men who claimed to commit acts of political violence on the part of the Syrian opposition. The United Nations Human Rights Commissioner has reported that more than 2,200 people have been killed since the security forces launched a bloody campaign to crush anti-government protests last March. Citing a pattern of widespread, systematic human rights abuses, UN Human Rights Commissioner Navi Pillay says the Damascus regime may be guilty of "crimes against humanity."